Michael Gallwey b 1790, Kilkeran (Clonakilty), Co. Cork, Brewer and Provider of Royal Mail Coach Service from Cork to Skibbereen and Waterford and his brother Charles b 1811 Major with Sir De Lacy Evan’s Legion against the Spanish Carlists (1835-7) and Some Galwey Magistrates and Lawyers. The Cork Gallwey/Galway family may be of Hiberno-Danish descent like the Cotters and Coppingers. They are remarkable for their survival skills appearing in Cork records from the 13th century and after many changes in religon, wealth are still prevalent not only in Ireland but in branches in France, Spain, Portugal, the West Indies and as well as the usual areas of Irish Emigration. Dennis Gallwey, Greenfield, Clonakilty, subscriber Dr. Daniel Donovan ‘History of Carbery, 1876. May be Denis McCarthy Gallivey, Greenfield, Clonakilty, executor of will of Rickard Donovan, Clerk of Crown d 1883, leaving £10,164. Michael J. Galwey/Gallwey Esq., Jnr., Esq., Ballina House, Clonakilty, sitting Rosscarbery, 1835, listed 1838, 1843 at Kikeleron House, voted 1850 for Denis Galwey as High Constable for Ibane and Ballyroe (Clonakilty). Subscriber Lewis Topographical Dictionary of Ireland 1837. Michael Galway, RM, Kilkieran House?, 1861, Skibbereen 1847. Subscriber memorial John O’Hea JP, Clonakilty 1847. Attending Railway meeting Drimoleague 1856. Thomas Hinton Gallwey, 1864, Glenburne, Glanmire, Resident, £90, listed 1875-6. 1870, listed 282 acres. 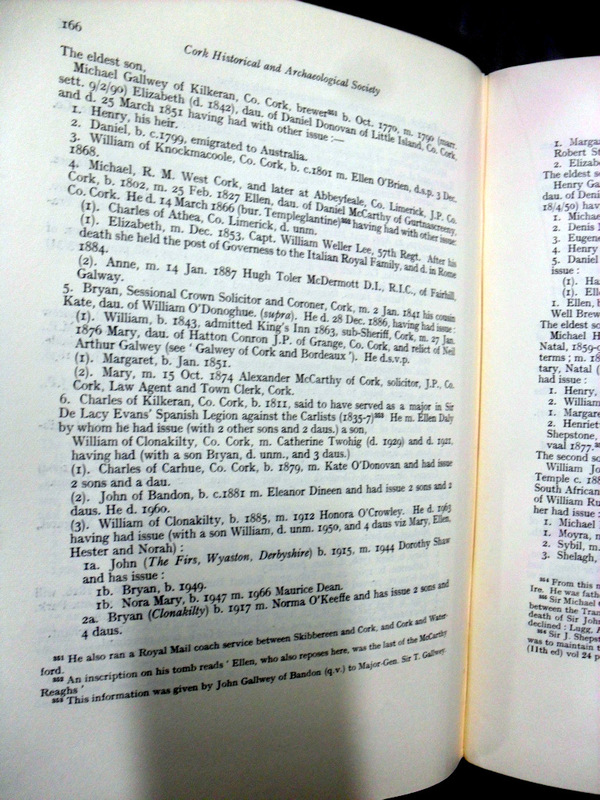 1734 John Gallwey Barrister did not practise Lota, Westcourt, d 1793 KIlkenny, buried Rathcoursey. c 1850 John Garcia Galwey Stipendary Magistrate, Trinidad Father Richard, Lota, grandfather MP for Kinsale living Lota. 1700 William Galweay Admitted Grey’s Inns Son and heir of John Esq. 1766-1865 William Galwey Attorney, Cork to 1814 then Dublin Lota, Freeman Limerick, m 1803, Buttevant, Ann d James Norcott, Springfield.